VANCOUVER—Oil sands opponents who have used their public relations muscle to fight the Keystone XL pipeline are turning their attention to two pipeline proposals in British Columbia. Although neither the Trans Mountain nor the Northern Gateway projects cross the border on land, the American arm of the conservation group Forest Ethics said the pipelines will result in an additional 700-plus tankers traversing the waters off the Pacific coast. “From pipelines to tankers to crude-by-rail, we’re facing an onslaught of new oil proposals, many of them toxic oil sands oil, that would turn the Pacific Northwest into a giant shipping lane for oil, gas and for coal,” spokesman Matt Krogh said at a news conference Tuesday in Seattle. Forest Ethics and others have fought a high-profile, celebrity-populated campaign against the proposed Keystone XL pipeline in the United States, stalling for several years the project that would deliver oil sands bitumen from northern Alberta to refineries on the U.S. Gulf Coast. A final decision from President Barack Obama on Keystone is expected in the coming months, Krogh said, and attention is turning toward the impact that oil shipments to the B.C. coast will have, including tankers and an increase in oil-by-rail from Canada. “You’re seeing the first steps in an international wall being created that’s actually going to stop tar sands export,” Krogh said. Canadian conservation groups, including Forest Ethics in this country, have long been battling the B.C. pipeline projects. 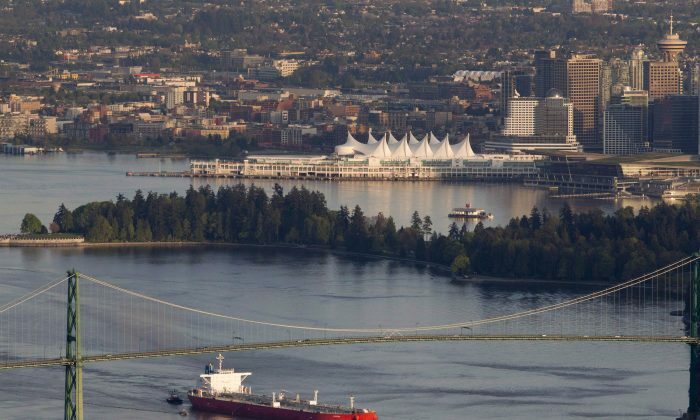 The campaign south of the border was launched with the new website tarsandssos.org, featuring real-time tracking of all tankers in and out of Kinder Morgan’s tanker terminal in Burnaby, the terminus of its Trans Mountain pipeline from Alberta. The Northern Gateway pipeline proposed by Calgary-based Enbridge would deliver 525,000 barrels of petroleum a day to a tanker terminal in Kitimat, on the north coast of B.C. Kinder Morgan’s proposed expansion of its existing Trans Mountain line would increase its capacity from 300,000 barrels a day to 890,000. A federal panel weighing the Northern Gateway terminal will issue its report to the federal cabinet by the end of the year, and Kinder Morgan is expected—after much discussion of its expansion plans—to officially file an application for the Trans Mountain line later this year. Federal government officials were in British Columbia last week to meet with First Nations groups that have staunchly opposed Northern Gateway, and Enbridge officials met over the summer with leaders from more than a dozen communities along the pipeline route. In a conference call with investors on Tuesday, Vern Yu, Enbridge’s senior vice-president of business and market development, said the company expects a decision from the federal cabinet by mid-2014—a decision they expect will be challenged by project opponents. “We expect that there would be some appeals to that decision and that would take us into early 2015 and at that point we would be able to start construction, which would allow for somewhere around a 2018 in-service date,” Yu said. CEO Al Monaco said Enbridge has done well engaging communities affected by Northern Gateway, but broader issues around oil sands development and general skepticism over energy projects have become bigger and bigger factors in the public debate.